On April 24 the British American Foundation of Texas held its annual Awards Ceremony at the Federal Reserve in Houston. Benefactors flew in from as far afield as Baltimore and the UK to present awards to our 2018 scholars. Her Majesty's Consul General, Karen Bell, welcomed guests and gave a brief outline of the work carried out by BAFTX and why it is so vital for the future of our communities. Lizi Xiong, BAFTX Award Winner 2016 spoke about her experience of the Junior Achiever program and how it completely changed her perspectives and ambitions. Jesús Terrones, Product and Service Delivery Manager at Cameron, military veteran, West Point graduate and Harvard MBA graduate gave a very personal and inspiring speech that made a great impact on both scholars and benefactors alike. As one recipient of a college scholarship noted: "The generosity of the benefactors of this amazing opportunity has granted me with the possibility to grow and share what I have learned with my community. I amsure that this experience will prepare me to become a useful asset to society and in the future to be abelt to return the generosity bestowed on me to future generations." More photos of the evening may be viewed here. 26 awards were presented, bringing together benefactors from as far afield as New York and Baltimore with the brightest academic stars of Texas. Her Majesty's Consul General, Karen Bell, welcomed guests and gave a brief outline of the work carried out by BAFTX and why it is so vital for the future of our communities. Ziba Colah, BAFTX Award Winner 2016 and student of Biochemistry and Biophysics at University of Houston spoke about how the award has changed her life and her future plans for a medical career. De Matthew Ware, originally from Swansea but currently researching nanotechnology and its medical applications at Baylor, was the keynote speaker. Benefactors from ConocoPhillips, Phillips 66, Hess Corporation, Williams Companies, British Airways, Enbridge Inc, Enterprise Products Partners, ACS International Schools Wood Mackenzie, TD Securities, British American Business Council, King and Spalding, FWB Park Brown and Faithful+Gould presented awards to students from Texas A&M, University of Houston, University of Texas, Houston Community College, Houton Baptist University, KIPP Generations Collegiate, Northside High School, Cesar Chavez High School, Carnegie Vanguard High School and Wharton Dual Language K-8 Academy. It was also the occasion to present the inaugural Susan Howard Community Service Award for future philanthropists and those who put the needs of their community first. 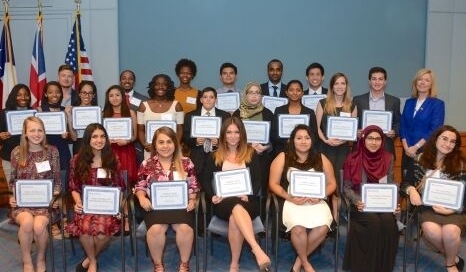 The 9th Annual BAFTX Scholarship Awards Ceremony was held on Tuesday May 12th 2015. Over 130 guests - including students, their families and friends, sponsors and the BAFTX Board of Directors, attended the ceremony. 34 awards were given this year, 26 Undergraduate Awards, 6 Junior Achiever Awards, 1 Early Starter Award and 1 Kids With Courage Award.